I was able to stop by Holocene this evening for the first half of FOSCON III: Really Radical Ruby. Those crazy kids. The event was sponsored by SQKWZR, which the two founding scientists/emcees claimed was fake -- but you know they're just saying that to keep people from stealing their ideas. Giles showed rubybeatz, wherein he generated a chaotic midi file and played it. Apparently his hard work on this had paid off earlier in the day when he was able to manifest an offhand comfort with the concept of call/cc in a discussion with Simon Peyton-Jones. Who says this stuff doesn't have real-world utility? Even after getting most of the crowd to don tinfoil hats, Lennon read our brainwaves and surmised that we had been storing exploitable data in cleartext in our databases. Cryptographically-secure hashing to the rescue. Luke spoke about parser generation for Puppet. He was asked why he didn't just implement this as an internal DSL in Ruby, Rails-style, rather than as a standalone language that happens to look Ruby-ish. He said he repeatedly had offered this to his users and that they just didn't want it. A fellow whose name I missed gave a demo of controlling a Lego Mindstorms robot via Ruby. The robot was paired to his Mac via Bluetooth; a local Rails webapp used this connection to send commands; the webapp interface was accessed via wifi from his iPhone. What could possibly go wrong? Ola Bini gave a whirlwind tour of JRuby. Points he made in its favor: interpreted performance on par with C ruby, ongoing compilation work promises big improvements beyond that, more tests. If there was a killer app mentioned it was that a complete Rails app can be packaged and deployed as a .war file in a Java servlet/JSP container, for less deployment friction in Java-centric enterprise environments. Plus: free pizza, O'Reilly book giveaways, and beer. Hi. 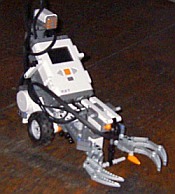 The Lego Mindstorms robot was ours. The person who programmed it is Eric Pugh. Hi Jason, thanks for the info. That was one cool demo!